The Pacific Community (SPC) has been bestowed the Asia Geospatial Excellence Award this week (17 October) by GeoSmart Asia for the application of geospatial technology in Disaster Management. 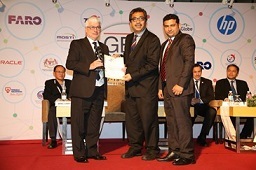 Accepting the award on behalf of the organisation at the GeoSmart Asia Conference in Kuala Lumpur, SPC Geoscience Division Director, Prof. Mike Petterson reiterated the importance of geospatial data and technologies to empower Pacific communities and decision makers in improving resilience to disaster and risk in the Pacific region. Small Island Developing States in the Pacific region are particularly vulnerable to natural hazards due to their small land area in a region of ocean, and the presence of geotectonic environments that produce earthquakes, volcanic eruptions, tsunamis and landslides. Meteorological and oceanic hazards such as cyclones, floods, and sea inundation in times of storm and high tide are ever present. Recent disasters including Cyclones Winston and Pam in Fiji and Vanuatu, floods in Honiara and tsunamis in Samoa, and west and east Solomon Islands caused loss of life and homes and significant costs to national economies. “I am very proud of this global recognition of the vital work the Pacific Community undertakes for disaster and risk. Geospatial technologies are playing an increasingly important role in early warning systems, assessment of post disaster damage and development of decision support systems that assist planners and national disaster management officers,” Pacific Community Director-General, Dr Colin Tukuitonga said. SPC has recently partnered with the World Bank and Digital Globe in applying geospatial data for hazard assessment and infrastructure risk and the use of satellite data in assessing risk and damage on the ground before and after disasters. “The World Bank is working closely with the Pacific Community in bringing new innovative products and services to the Pacific region to better inform government and communities about the nature and impact of disasters, and quantifying risk, so that we can build safer communities and towns for the future,” Regional Coordinator for climate and disaster resilience for the World Bank Pacific, Denis Jordy, stated.